This 1.17 Acre lot is framed by a canopy of trees & flowering azaleas. Brick walkways lead to a tiled front patio and a screened front porch to the left. Double door front entry with spacious patio and front screened porch to the left. Double door entry into front foyer. Guests are greeted with custom wood floor inlay and cathedral ceiling. Plenty of light fills this 31'x22' Living Room with its 18' beamed ceiling and grand windows. A stacked stone fireplace warms the living room and sliders open onto a Florida Room overlooking the pool. A peek at the kitchen from the living room. Located in the center of the home, this kitchen overlooks the morning room and pool. It features an abundance of wood cabinetry, wall ovens, cooking island and opens to the living room, Florida room and breakfast room. View of the kitchen from the breakfast room. A covered flagstone patio with outdoor grill as viewed from the breakfast room. The perfect setting to serve drinks and entertain guest before and after dinner. Pool Party best describes this setting and the flagstone floors will certainly handle the pool traffic. This patio also features an outdoor kitchen. Flagstone floors grace this cedar encased Florida room. Open the sliders to enjoy the pool, waterfall and gardens. The wood floor in this Formal Dining Room mirrors that of the foyer. This room measures 20'x14' and opens onto the bar. There are plenty of spaces to enjoy the pool...inside and out. Powder bath located off the foyer. This first floor bedroom (16x14) looks out to the front screened porch. This full bathroom is adjacent to the ground level bedroom. Front Screened porch allows you to enjoy the front gardens and blooming azaleas. Take the oak staircase to the bedroom level. This master bedroom has slider to a private balcony. This 22'x21 Master Bedroom will accomodate the largest of furnishings. This 20'x21' master bath has 2 vanity walls, a private water closet, shower stall and jetted tub...and a doorway to the 2 walk-in closets. One of 2 upstairs guest bedrooms measuring 16x14. Upstairs guest bath with 2 sinks. Bedroom #3 upstairs also measures 16x14. Downstairs is an enormous laundry and utility area. The oversized 2 car garage has an incredible amount of ground level storage. This unique custom-built cedar home, reminiscent of a mountain chalet, beckons the nature lover with its natural Florida gardens and spectacular flowering azaleas. Tucked amongst a canopy of native palms and shady oaks, it boasts screened living areas, front and back, from which to enjoy this private serene setting. 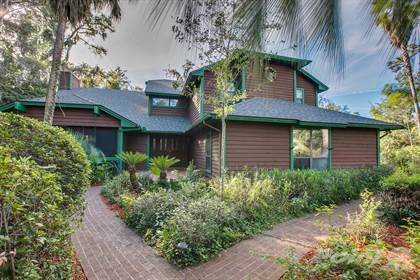 This sanctuary is located within the elusive sought-after community of Elysium bordering historic downtown Mount Dora and surrounded by natural beauty. A circular drive meanders through azaleas and palms delivering you to your tranquil retreat and provides abundant guest parking. A large foyer invites guests into this home designed for family living and entertaining. Downstairs is an immense 31’x22’ living room with a wood burning fireplace and soaring 18’ cathedral ceilings; a large bedroom with adjacent full bath; a powder bath; a flagstone Florida room with sliders to the pool; a formal dining room; a flagstone family room with wet bar also opening to the pool patio; and a centrally located 22’x21’ kitchen with cooking island and large breakfast room all overlooking the pool. A 10’x20 inside utility area and an oversized garage with a ½ bath and storage closets complete the downstairs. A spacious upstairs landing services the 2 guest bedrooms, a full guest bath and an incredible owners’ suite with sliders to a private patio, 2 walk-in closets, dual sinks, shower stall and garden tub. The backyard pool offers a cooling respite on hot summer days and, with its rock water feature, a picturesque setting year ‘round. The current family has loved and maintained this home for the past 22 years, but it is time to downsize allowing a new owner to take this magnificent 5008 sq. ft. home to a new level. It is time for new décor throughout this well-kept home which the seller acknowledges. The property has been priced accordingly knowing a new owner will invest in new décor, appliances and fixtures. A NEW ROOF was installed in 2018. Mount Dora enjoys a wonderful, award-winning reputation for its lifestyle and location, and this home along with the Elysium Community, are desirable examples. Hi, I'd like to find out more information about 926 Elysium Blvd, Mount Dora, FL 32757. Thanks so much!